Protesters at a federal detention center in New York in March. NEW YORK—The Immigration and Naturalization Service is detaining people on routine visa violations and holding them for weeks or months until the Federal Bureau of Investigation “clears” them, an unusual process “shrouded in secrecy,” according to Amnesty International. In November, the INS admitted to detaining 1,200 people. The exact number now in custody is not known, however, because many additional immigrants have been rounded up and released since then. On March 23, members from at least 30 unions rallied in front of a federal detention center where an estimated 40 Pakistani and other Muslim immigrants swept up after September 11 are being held. They joined the 150 or so regulars who’ve been protesting the secrecy, unlimited detentions and violation of the due process rights of foreign detainees every Saturday since January 26. The demonstration was held one week after an Amnesty International report singled out the federal Metropolitan Detention Center in Brooklyn for violating basic rights under international law in its treatment of September 11 detainees. Amnesty documented “a disturbing level of secrecy” by the federal agencies detaining people at the MDC and other centers nationwide. Nonetheless, by interviewing 30 lawyers, groups working with the detainees and those released, and detainees’ relatives, Amnesty was able to piece together evidence the U.S. government is ignoring constitutionally protected rights to due process, access to lawyers and prompt filing of charges. Amnesty also expressed grave concern at the flouting of the rule of law. “Scores of people were held for more than 48 hours,” the report says, “and several for more than 50 days, before being charged with a violation.” One Saudi Arabian man was held for 119 days before being charged. A new INS regulation also allows the service to override immigration judges’ decision to grant bail, a practice that “undermines the principle of the separation of powers between the executive and the judiciary,” according to Amnesty. Amnesty found troubling cases of detainment in 26 states, though most detainees are in New York and New Jersey. Among its findings: MDC staff told the wife of a detainee her husband was not there, even though she had received letters from him postmarked from the facility; staff illegally barred her from visiting him; more than 40 detainees may be confined to cells for 23 hours a day; and 19 MDC detainees did not have lawyers as of late 2001, leading one man to go on a hunger strike. The Amnesty report also found numerous instances since September in which the government has not informed families and lawyers of where detainees are imprisoned or when they are moved. Detainees have been prevented from posting bail, held even after bail is posted, and denied the right to counsel. Others were “obstructed in their ability to make phone calls.” As it is, MDC detainees are allowed only one phone call per week: If there is no answer at the law office, they must wait another week to try again. Most of the detainees the government has admitted to rounding up are Pakistani (207), followed by Egyptians (74), Turks (46) and Yemenis (38). However, the INS has created a category of “inactive” detainees about which it refuses to release information. While Amnesty gained limited access to the New Jersey county jails, the MDC in Brooklyn refused to allow investigators entry. Racial profiling of the sort seen since September violates international law, the report charges. “There is also concern that statements made by the government purporting to link routine immigration cases with potential terrorism may fuel anti-immigrant sentiments and contribute to a wider backlash,” it says. New York City Labor Against the War (NYCLAW) was begun in first days after September 11 by a small, interracial group of elected local union officers and rank-and-file union members. Its dual purpose has been to serve as an antiwar pole within labor, and as a labor pole within the antiwar movement. NYCLAW was founded on the premise that, much as Vietnam Veterans Against the War had a particular credibility and obligation in the 1960s and ’70s, trade unionists who have directly witnessed and suffered from September 11 have a special role to play in dissenting from enthusiastic support for Bush administration’s “war on terrorism” voiced by most of U.S. labor officialdom. On September 27, therefore, NYCLAW issued a written statement arguing that workers in the United States should oppose the war-both abroad and at home. Unlike either the pacifism or generalized anti-imperialism which characterizes many antiwar statements, NYCLAW is a conscious attempt to outline, without lapsing into left sloganeering, why the war undermines with the collective interest of workers in New York and beyond. Within days, the statement had been signed by scores of New York metro area trade unionists, including a small, but significant number of elected union officers. All but one of these officers speak in an individual capacity. The exceptions are officers of AFSCME DC 1707, which represents some 25,000 workers at non-profits with city contracts, and which is the only union body in New York City to have officially endorsed NYCLAW. In the subsequent year, NYCLAW’s statement has been endorsed by some 1,200 trade unionists and labor bodies, from New York City and across the globe. NYCLAW participants are, by any standard, few in number, and the organization has been virtually ignored by the mass media. Similarly, in November, the International UAW’s magazine reported that “[d]despite his proximity to the [September 11] attack, [a UAW local president active in NYCLAW] is opposed to a military response or an ethnic response, or to have the disaster turned into a pretext for an assault on civil rights.” Shortly thereafter, the UAW summarily rejected a demand for removal of this local president for his antiwar activity. •Affiliation with the New York Coalition for Peace and Justice, which sponsored a 10,000-strong protest on October 7 in New York City. 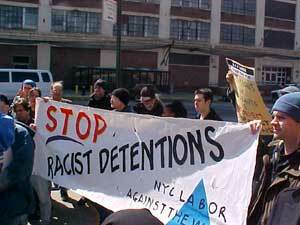 •Days of NYC Labor Solidarity with Immigrant Detainees in Brooklyn, in March and September 2002, endorsed by some sixteen labor bodies and attended by nearly 400 people. •May 21 protest against trade union investments in State of Israel bonds. More broadly, NYCLAW representatives have spoken at numerous antiwar events, including the 100,000-strong London antiwar demonstration on November 18, and at the 25,000-strong February 2 Counter-WEF protest in New York City. On October 19, NYCLAW will hold its first one-day organizing conference, which will be attended by trade unionists from NYC and beyond. NYCLAW’s modest work at Ground Zero demonstrates the great need and potential for a labor antiwar voice even–and perhaps because of–the trauma of 9/11 and subsequent events. The Bush administration’s impending war on Iraq is likely to generate a much broader level of working class antiwar sentiment. *Affiliation for identification only and does not imply organizational endorsement. NYCLAW was founded on the premise that, much as Vietnam Veterans Against the War had a particular credibility and obligation in the 1960s and ‘70s, trade unionists who have directly witnessed and suffered from September 11 have a special role to play in dissenting from enthusiastic support for Bush administration’s “war on terrorism” voiced by most of U.S. labor officialdom. On September 27, therefore, NYCLAW issued a written statement arguing that workers in the United States should oppose the war-both abroad and at home. Unlike either the pacifism or generalized anti-imperialism which characterizes many antiwar statements, NYCLAW is a conscious attempt to outline, without lapsing into left sloganeering, why the war undermines with the collective interest of workers in New York and beyond. Within days, the statement had been signed by scores of New York metro area trade unionists, including a small, but significant number of elected union officers. All but one of these officers speak in an individual capacity; AFSCME DC 1707, which represents some 25,000 workers at non-profits with city contracts, is the only union body in New York City to have officially endorsed NYCLAW. Since that time, the statement has been endorsed by more than 500 New York City union officers and members, and by an additional 350 trade union bodies, officers and individual members from other cities and countries. With similar tolerance, the International UAW’s magazine reported that “[d]espite his proximity to the [September 11] attack, [a UAW local president active in NYCLAW] is opposed to a military response or an ethnic response, or to have the disaster turned into a pretext for an assault on civil rights.” Shortly thereafter, the UAW summarily rejected a demand for removal of this local president for his antiwar activity. Meanwhile, NYCLAW has played a modest, but important role. NYCLAW’s statement has been widely circulated via hard-copy and the internet, and has been spontaneously translated into Arabic, Spanish, French, German, Italian, Russian, Turkish, and other languages, and the organization operates a listserv with 1100 subscribers. It is affiliated with, and one of the most active components of, the New York Coalition for Peace and Justice, which sponsored a 10,000-strong protest on October 7 in New York City-the largest post-9/11 antiwar demonstration in the U.S. to date. NYCLAW representatives have spoken at numerous events, including the 100,000-strong London antiwar demonstration on November 18, and at the 25,000-strong February 2 Counter-WEF protest in New York City. NYCLAW has helped convene an informal national labor antiwar network that includes the Labor Committees for Peace and Justice in the San Francisco Bay Area, D.C. and Albany. It held a December 12 labor forum on civil liberties and immigrant rights attended by about 100 people, and was largely responsible for organizing a March 23 Day of NYC Labor Solidarity with Immigrant Detainees in Brooklyn endorsed by some ten labor bodies and attended by nearly 400 people. NYCLAW is one of four host organizations for national antiwar protests in D.C. on April 20. These efforts reflect a high level of dedication, cooperation and principled behavior on the part of some fifty of NYCLAW’s most active participants, both independents and members of various left organizations, who have united to express working class antiwar voice. To subscribe to the NYCLAW listserv, send an e-mail to: ,or visit . 1. NYCLAW’s other three co-conveners are: Larry Adams, President, Mail Handlers Union, L.300; Ray Laforest, Staff Representative, AFSCME DC 1707; and Brenda Stokely, President, AFSCME L.215, DC 1707. Union positions for Letwin and Adams given for identification only; no organizational endorsement implied. 2. The full text of NYCLAW’s statement is available at: http://groups.yahoo.com/group/LaborAgainstWar/files/. 3. To date, these have come to include: Larry Adams, Pres., National Postal Mail Handlers Union L.300; Barbara Bowen, Pres., Professional Staff Congress-CUNY/AFT L.2334; Arthur Cheliotes, Pres., CWA L.1180; Glenn Huff Jr., Pres., AFSCME L.205, DC 1707; Uma Kutwal, Fmr. Pres., AFSCME L.375, DC 37; Michael Letwin, Pres., Assn. of Legal Aid Attorneys/UAW L.2325; Jill Levy, Pres., Council of Supervisors & Administrators, NYSFSA, AFSA L.1; Kim V. Medina, Pres., AFSCME L.253; Pres., DC 1707; Victoria Mitchell, Pres., AFSCME L.107; VP, DC 1707.; Maida Rosenstein, Pres., UAW L.2110; Viji Sargis, Pres., AFT L.6025, Montclair State U.; Joel Schwartz, Pres., AFSCME, Civil Service Employees Assn. L.446; Judy Sheridan-Gonzalez, RN, Chair., State Del. Assembly, NY State Nurses Assn. ; Brenda Stokely, Pres., AFSCME L.215, DC 1707; and Jonathan Tasini, Pres., Natl. Writers Union/UAW L.1981. 4. Deidre McFadyen, Some Union Heads Oppose ‘Bush War,’ Chief-Leader, Oct. 26, 2001, at http://groups.yahoo.com/group/LaborAgainstWar/message/246. 5. Ashes Fell as UAW Members Fled from the Carnage, Solidarity, Nov. 2001, at http://uaw.org/solidarity/01/1101/feature01.html. 6. Extensive coverage of NYCLAW’s participation at the London protest can be viewed at http://groups.yahoo.com/group/LaborAgainstWar/message/383. 7. The full list of over 100 endorsers of this event can be viewed at: http://groups.yahoo.com/group/LaborAgainstWar/message/709. 8. Christopher Lawton, Giving Detainees a Voice, B’klyn protests continue, joined by labor unions, Newsday, March 24, 2002, at http://www.newsday.com/news/local/newyork/ny nyprot0324.story; and Albor Ruiz, New Outcry Over Jailed Immigrants , N.Y. Daily News, at http://www.nydailynews.com/2002 03 25/News_and_Views/City_Beat/a 145443.asp; photos are available at: http://dianelent.com/news/news.html and http://www.nyc.indymedia.org/. ALAA/UAW 2325’s statement concerning defense of civil liberties following September 11 is available at: <http://www.topica.com/lists/LegalAidAttorneysBulletin/read/message.html?mid=903587941&sort=d&start=25&gt;. The Bay Area Labor Committee for Peace and Justice organized a simultaneous labor antiwar demonstration. Josh Richman, Unions fight for post 9/11 respectability, 200 workers rally in Oakland over threats to ‘civil rights,’ Oakland Tribune, at http://www.oaklandtribune.com/Stories/0,1002,1726%257E483919,00.html. 9. Information about the April 20 protests is available at: http://unitedwemarch.org/. That was the chant 300 protesters intoned as they approached Brooklyn’s Metropolitan Detention Center, where at least 40 Arab and South Asian immigrants have remained imprisoned since shortly after Sept. 11. Hundreds more around the country are in a similar situation. Yet, six months after the World Trade Center attacks, none of them have been charged with any role in the tragedy, and the government has revealed little information about who they are, their whereabouts or what will happen to them. Saturday’s unusually cold and windy weather did nothing to dampen the enthusiasm of the demonstrators – a coalition of trade unionists, immigrant organizations and civil rights groups – who marched from Ninth St. and Fifth Ave. in Park Slope, to the federal detention center at 29th St. and Third Ave. in Sunset Park. There, carrying signs that read, “Tell us their names,” they held a spirited rally. Even though protests have been held each Saturday at noon outside the prison since Jan. 26, this one, billed NYC Labor Solidarity With Immigrant Detainees, was the biggest to date. “This is the first time the largely immigrant New York City labor movement has really gotten involved in supporting the Arab and South Asian immigrants imprisoned since the post-Sept. 11 crackdown on civil liberties,” said Livia Gershon, a member of Local 32B-32J. In the first two months after the twin towers disaster, the government detained 1,200 immigrants, most of them of Arab, South Asian and Muslim background. On March 14, Amnesty International made public the results of an investigation revealing that hundreds of people are still deprived of their freedom. The human rights group found out that the Immigration and Naturalization Service is detaining people on routine visa violations and holding them for weeks or months until the FBI “clears” them. The INS refuses to provide the names and locations of most of the detainees. According to the Amnesty International report, the detainees are deprived of basic rights guaranteed under national and international law. These include the right to humane treatment, to be informed of the reasons for the detention, to challenge the lawfulness of the detention, to have prompt access to a lawyer and to be presumed innocent. The Metropolitan Detention Center does not fare well in the report. In one clear example of civil rights violation, Amnesty International says that center staff told the wife of a detainee that her husband was not there, even though she had received letters from him postmarked from the facility. They also illegally barred her from visiting him. Besides, the detainees are confined to cells 23 hours a day in cruel conditions, and 19 of the 30 people detained there did not have a lawyer as of late 2001, it is reported. Traditionally, civil liberties and democratic rights become vulnerable in times of crisis, precisely when they are more essential than ever. Join trade unionists, immigrant, civil rights, peace, and social justice organizations to oppose the mass detention of foreign nationals since Sept. 11. Most of the detainees are from the Mid-East and South Asia. The government has refused to release most of the detainees’ names. Because of this secrecy, some detainees may not have access to legal counsel. Some have suffered inhumane conditions of confinement. Virtually none have been charged with terrorist acts. Some of these detainees are being held at the Metropolitan Detention Center, a federal prison in Sunset Park, Brooklyn. •UNITE Amalg. Services & Allied Joint Bd. *Position shown for ID only; no organizational endorsement implied. The following are reports on parallel labor demonstrations concerning the war that took place Saturday, March 23 in New York City and Oakland, CA. Some 350-400 people attended the Day of NYC Labor Solidarity with Immigrant Detainees who have been held following September 11. The event supported ongoing weekly protests by immigrant, civil liberties and peace organizations at the federal Metropolitan Detention Center in Sunset Park, where many of the detainees are held. Yesterday’s event began with a diverse and spirited march led by labor banners from 5 Ave./9 St. in Park Slope. A rally outside the jail heard brief statements from: Norman Siegel, Freedom Legal Defense and Education Project; Debbie Almontaser, Arab-American Family Support Center; Michael Letwin, Pres., Association of Legal Aid Attorneys/UAW L.2325; Co-Convener NYC Labor Against the War (NYCLAW); Martha Cameron, Justice for Detainees; Subash Khateel and Monami Maulik, DRUM (Desis Rising Up And Moving); Dr. Mansoor Khan, Help and Hope; Larry Adams, Pres., Mail Handlers Union L.300; Co-Convener, NYCLAW; Gary Goff, Recording Secretary, AFSCME L.2627, DC 37; Chaumtoli Huq, Counsel, New York Taxi Workers Alliance; Barbara Bowen, Pres., Professional Staff Congress-CUNY/AFT L.2334; Saul Nieves, Political Action Dept., SEIU L.32B-J; J.P. Patafio, Depot Chair, TWU L.100; Hank Sambach, Exec. Bd., NY Public Library Guild/AFSCME L.1930; Brenda Stokely, Pres., AFSCME L.215, DC 1707; Co-Convener, NYCLAW; and (via e-mail) the Bay Area Labor Committee for Peace and Justice, which held a similar rally yesterday in Oakland, CA (see below). Media present at the rally included WBAI radio, Channel 13 (PBS), German and Japanese TV. The Labor March for Justice in Oakland yesterday was quite successful. We had hoped to draw between 300-400 and probably got something between to 300-350. The march was led by the ILWU drill team (all African Americans). We had large contingents of immigrant workers (mostly Latinos), with a smaller number of Filipinos and fewer still Middle Easterners. We also had a delegation of Japanese union members, who happened to be in town for a meeting, march with banners in Japanese and English. A racially and ethnically diverse contingent marched from POWER representing welfare/workfare workers. Folks participated from all the cosponsoring unions and worker organizations. We marched the short distance from our assembly point at 13th and Broadway (main thoroughfare in downtown Oakland) into the City Center to the Federal Building where we had a few short speeches. Then we marched (on the sidewalk so that we did not require permits) about a mile to Jack London Square to our rally site overlooking the port. The Freedom Song Network provided music. We had about a dozen speakers, including the Secretary-Treasurer of ILWU Local 10, the husband of the fired Palestinian Macy’s worker, airport screeners, folks from POWER, a restaurant worker from HERE Local 2850, someone who spoke about US troops in the Philippines, immigrant speakers in Spanish, a spokesperson for the Japanese delegation, etc. We read a greeting from the NYC Labor Against the War. Our MCs were Zev Kvitsky, Vice President of SEIU 715; and Andrea Dehlendorf, Organizing Director at SEIU 1877 (Janitors). Principal officers from a number of local unions attended. Speeches covered the range of issues arising out of the impact that the ‘War on Terrorism’ has had on various communities, on the threat to civil liberties, and on U.S. foreign policy and military involvement throughout Asia and the Middle East. There could be no doubt this was an anti-war gathering, not just a protest about domestic impacts. There were a number of media folks present, including the Oakland Tribune, at least one or two TV stations, alternative press and KPFA, and reporters from a couple of ethnic community papers. On Saturday, March 23, labor organizations will join community and immigrant rights groups to support the hundreds of Arab and South Asian immigrants who remain imprisoned since September 11. None of the detainees have been charged with any role in the attacks. Last week, Amnesty International reported that “a significant number of detainees continue to be deprived of certain basic rights guaranteed under international law. These include the right to humane treatment, as well as rights which are essential to protection from arbitrary detention, such as the right of anyone deprived of their liberty to be informed of the reasons for the detention; to be able to challenge the lawfulness of the detention; to have prompt access to and assistance from a lawyer; and to the presumption of innocence.” <http://web.amnesty.org/ai.nsf/Index/AMR510442002?OpenDocument&of=COUNTRIES\USA>. 10:30 a.m. March from 9 Street and 5 Avenue in Park Slope. Note: Authors of remarks and/or questions answered here are named only where already identified in a public email or meeting. *Overview. ALAA, 1199 and the Legal Aid Society are mobilizing to oppose severe cuts in criminal and civil Society funding. Without those funds, the Society’s already-sizable deficit will widen, with potentially severe conse­quences for staff and clients. This year, however, the Society and its unions stand a better chance of success than perhaps at any time since the Giuliani adminis­tration first retaliated for the 1994 strike. *Budget Numbers. Between 1994 and 2001, the Giuliani administration systematically transferred a cumulative $160 million in CDD/CAB funds to private 18-B assigned counsel and to runaway defense contractors. As a result, the Criminal Defense Division and Criminal Appeals Bureau are running a combined $4.6 million deficit in FY02 (ending June 30, 2002) due to: (1) Elimination of state funding for the Parole Revocation Defense Unit ($1.3 million); (2) Unreimbursed city COLA funds for collective bargaining ($2.7 million); and (3) $600,000 in unrealized attrition. The Bloomberg administration’s intentions toward LAS are unclear. Unless significantly modified, however, its proposed preliminary FY03 budget (beginning July 1, 2002) will effectively double the Society’s current criminal defense deficit to more than $10 million. Bloomberg’s budget also threatens Civil and Volunteer division representation by seeking to eliminate $5.25 million in citywide civil legal services funding for senior citizens, the disabled and families. In July 2000, the ALAA Executive Board (EB) unanimously proposed, and the Delegate Council (DC) overwhelmingly adopted, reaffir­mation of the Union’s oppositi­on to layoffs and/or involuntary Staff Attorney transfers between or within divisions. FAQ On LAS Criminal Budget Shortfall (ALAA, Aug. 1, 2000). Nonetheless, a worst-case scenario for the next fiscal year cannot rule out severe conse­quences, including—but not necessarily limited to—inter-divisional transfers and/or layoffs. At the very least, it would adversely affect the circumstances for negotiation of ALAA’s next contract, which takes effect October 1, 2002. **Two recent New York Times editorials urging restoration of LAS funds. **An estimated $4 billion city deficit, in response to which elected officials have already been besieged by myriad pleas for assistance. As in previous years, therefore, it will be necessary to effectively mobilize ALAA and 1199, and their combined strength of more than one thousand members at LAS. –Monday, March 18, 12:30-2:00 p.m.: Manhattan, 49 Thomas,1st Floor. –Tuesday, March 19, 12:30-2:00 p.m.: Queens, 120-46 Queens Blvd., 4th Floor. –Wednesday, March 20, 12:30-2:00 p.m.: Brooklyn, 111 Livingston, 7th Floor. –Friday, March 22, 12:30-2:00 p.m.: Bronx, 1020 Grand Conc., Library. **Press outreach and public relations. This campaign is coordinated by a commit­tee that includes ALAA representatives George Albro, William Gibney, Charlotte Hitchcock, and Adriene Holder; 1199 representatives Irma Camacho, Lucy Herschel, Betty Hughley, Margaret McClean, and Dorothy Williams; and LAS representatives Steve Banks, Path Bath and Bernette Carway-Spruiell. *Bar Exam, Time Off to Study. A. “Other than using vacation days, there is no contractual right to time off to take or study for the bar exam (The contract requires the Society to provide ‘days off’ only to second time bar takers who failed the bar on the first try and only in order to permit their participation in a Society-sponsored bar review class; see Art III, Sec. 3(B) of contract). *CDD Comp Day Grievance. On February 21, Management informed CDD staff that it had agreed with the ALAA Executive Board’s February 5 proposal to suspend “the [new] policy regarding compensatory time payouts” pending expedited negotiation and/or arbitration of the issue. Later that day, the ALAA Dele­gate Council voted 15-0-4 to ratify the EB’s proposal. Report on Feb. 21 Delegate Council, Feb. 25, 2002. *Computer Ergonomics. Management is looking into ALAA’s request for accommoda­tion of displaced members of the Prisoners Rights Project who prefer desktop PCs to laptops. The report is available at: <http://nycla.org/publications/taskforce.html#narrative@. *Health and Safety. (Note: 90 Church Street status is addressed in a separate March 6 report from ALAA Recording Secretary Char­lotte Hitchcock). Daniella Korotzer: “As your Health & Safety rep. on the union’s Exec. Board I am concerned that many of your health & safety issues are not reaching me. So – I want to remind you all to contact me (or ask your dele­gate to contact me) about any such concerns. “This can be 90 Church St./WTC related, but doesn’t have to be. For example, if there are rodent-issues, falling elevators, security con­cerns, etc., please let me know. I would also hope that you all would make me aware of any changes to your health that you believe is related to the building/office you are working in. If there is a problem that affects a large group in one place, you may want to decide on one individual to be in contact with me. A. “The [CAB] grievance involved division management’s decision to stop an attorney from continuing to telecommute, as do many CAB attorneys, particularly since 9-11. Since there were no good reasons given to end his telecommuting, the decision was quickly re­versed upon challenge. “More generally, the 1998 contract provided that: ‘Staff Attorneys will, in consultation with their supervisors, be permitted to telecommute to the extent consistent with the nature of their work and other staffing/work needs of the office. Although it has limited feasibility for many jobs, particularly in trial offices, Management will facilitate telecommuting by lending a limited number of laptop computers for limited time periods; seeking group discount buy­ing/leasing opportunities; and maintaining and expanding the remote access properties of the network’. . . .
**Q (CDD-Manh.). What are my rights to transfer to JRD or to another CDD boro? *TransitCheks. The Society has reported that “[w]e are in process of ordering TransitCheks for the period April-June 2002. TransitCheks will be distributed on Friday, April 5.” Memo of Feb. 25, 2002 from Toni Johnson to Everyone. –Buyer’s Edge Group #1324 (see brochure). –Union Privilege (loans, etc.) 800.452.9425. This vote followed extensive membership discussion of the proposed statement, which had been unanimously proposed by the Executive Board on January 14. In the wake of September 11, similar posi­tions have been taken by numerous other legal, labor, civil rights and professional organiza­tions. Pursuant this statement, ALAA is one of several unions supporting a Day of NYC Labor Solidarity with Immigrant Detainees, which will take place on Saturday, March 23 at the Metro­politan Detention Center in Brooklyn (details to follow). *Police Abuse: Louima Case. ALAA members and Frank Serpico are among the 19 signers of a letter published in the March 5 NYLJ concerning last week’s Second Circuit decision that overturned the conviction of three NYPD officers in the 1997 torture of Abner Louima. *Rockefeller Drug Law Reform. For the second year in a row, ALAA, 1199 and LAS are mobilizing Society staff for Drop the Rock, a major effort in Albany on March 26 to repeal and/or reform the Rockefeller Drug Laws. As outlined in a March 6 memo from Theresa de León (LAS), George Albro (ALAA) and Betty Hughley (1199), Society staff may take release time to meet with legislators on this issue. Further details are available at: <http://www.1199seiuonline.org/docs/droptherock.pdf@, <http://www.droptherock.org/DTR_Day.htm@. *ACLA Executive Board Representative. On February 21, the Delegate Council unani­mously elected Monica Dula (CDD-Bx) to fill the vacant Attorneys of Color of Legal Aid position on the Executive Board. *Bylaw Revision. The February 21 Dele­gate Council elected by acclamation the follow­ing unopposed nominees to the new ALAA Bylaw revision commission: Susan Morris (CDD-Bk), Jessica Botticelli (CDD-Manh. ), Peter Blum (CAB/Capital/FDD). Although the commission will now begin its work, nomina­tions remain open for selection of one member from each of the remaining constituencies (CDD Bronx and Queens, Civil, JRD, and Volunteer). The commission, chaired by George Albro, will formulate proposals to more closely con­form ALAA bylaws with UAW rules (including potential change from current flat dues, to 1.15% progressive dues; see below) and other bylaw issues to be determined. **Q (CDD-Qns). What were my Union dues last year? **Q (CDD-Bk). Why do we have to talk about changing our current dues structure? **Q (CDD-Bk). How do ALAA members benefit from UAW affiliation? –Provided ALAA with a cumulative $400,000 subsidy between 1995-1999, thereby insulating ALAA members from the need for yet higher dues. –Helped in 1995 to convince elected offi­cials, especially upstate Republicans, to restore more than $10 million in LAS state criminal funding, thereby averting layoffs for hundreds of ALAA members. –Funded all costs (more than $100,000) of ALAA’s federal litigation challenging the Giuliani administration’s retaliation for the 1994 strike. –Conditioned its 1998 gubernatorial en­dorsement on restoration of CDD/CAB city funds, the cumulative total of which has come to $21 million over four years. –Advocated such client-related legislation as repeal of the Rockefeller Drug Laws. –Made LAS civil and criminal funding the #1 UAW Albany lobbying priority. *Meeting Schedule for 2002. On February 21, the Delegate Council adopted a 2002 sched­ule for Executive Board and Delegate Council meetings, at 13 below). *UAW Convention Delegates. On June 2-7, the 33d International UAW Constitutional Convention will take place in Las Vegas. Convention delegates elect the UAW’s Interna­tional officers and regional directors, and vote on proposed constitutional amendments, resolu­tions, etc. ALAA is entitled to send two dele­gates and two alternates. As previously noticed, pursuant to the UAW Constitution Article and to unanimous vote of the February 21 ALAA Delegate Council, nominations must be delivered to Michael Letwin (who, due to LAS funding and other Union business, will not be a candi­date for UAW Convention delegate) at ALAA HQ by March 12, 2002. If none of the positions are contested, the nominees will be deemed elected by acclama­tion. If any of the positions is contested, the March 19 DC will elect a special election com­mittee to conduct a secret-ballot membership vote in the offices. *CUNY Law School. Full-time adjunct position in our Battered Women’s rights Clinic beginning June 2002. This clinic is one of six clinics of Main Street Legal Services, the Law School’s clinical program. Duties of the teaching position including working with other clinical teachers in the clinical program, direct supervision of third-year students in client representation and projects; development of curriculum, simulations, and advocacy materials; and joint classroom teach­ing. We are seeking a creative and experienced lawyer/teacher with a desire to work collabor­atively in a diverse environment, a serious commitment to clinical teaching, and a commit­ment to our mission as a public interest law school. J.D. degree or its equivalent required. We are also hoping that the person hired could supervise social work students in a new program that combines social work and law on behalf of clients. Therefore, we are especially interested in hiring someone with an M.S.W. and experience supervising social workers. While an M.S.W. is not required, experience in family law is and working with survivors of domestic violence is preferred. Salary is $55,000-70,000 DOE and qualifi­cations. The position is for a one-year appoint­ment with a possibility of future appointments. EO/AAE. Cover and resume by April 10, 2002 to: Susan Bryant, Director of Clinical Programs, City University of New York School of Law at Queens College, 65-21 Main Street, Flushing, NY 11367. *Yale Law School. Yale Law School seeks applications for the Robert M. Cover Fellowship in Public Interest Law, a two-year position beginning on July 1, 2002 in the Yale Law School clinical program. The fellowship is designed for lawyers with at least four years of practice who are interested in preparing for a career in law school clinical teaching. Responsibilities include representing clients, supervising students, teaching classes, and working on one’s own scholarship. All work will be conducted with the assis­tance of the clinical faculty and will focus on providing legal assistance to low-income clients and organizations. This year’s candidates must be experienced transactional lawyers, interested in working with our Housing & Community Development Clinic. Candidates must be able to work both inde­pendently and as part of a team, and must pos­sess strong written and oral communication skills. CT Bar admission or willingness to take the July 2002 bar examination required. In addition to a stipend of approximately $40,000, Fellows receive health benefits and access to university facilities. Send a resume, cover letter, and names, addresses, and telephone numbers of three references by March 15, 2002 to: J.L. Pottenger, Jr., Director of Clinical Studies, The Jerome N. Frank Legal Services Organization, P.O. Box 209090, New Haven, CT 06520-9090; tele­phone: 203.432.4800; fax: 203.432.1426; or email Kathryn Stoddard: kathryn.stoddard@yale.edu. As a labor union whose members fight each day for the statutory and constitutional rights of indigent New Yorkers, The Association of Legal Aid Attorneys, UAW Local 2325, is deeply opposed to the Bush administration’s broad assault on precious civil liberties and democratic rights. This assault mirrors other shameful periods of racial, ethnic and/or political hysteria in American history, among them the Alien and Sedition Acts (1798), Asian exclusion (1880s-1890s), “Sedition” prosecutions (World War I), the Palmer Raids (1919-1920), Japanese-American internment (1940s), McCarthyism (1950s), the FBI’s COINTELPRO war on dissent (1960s), and exclusion of Haitian and Central American political refugees (1980s). •”USA Patriot Act,” which authorizes the government, without meaningful judicial review, to: designate domestic groups as “terrorist organizations”; indefinitely incarcerate or detain non-citizens based on mere suspicion; deport immigrants for innocent association with others; and violate confidential financial, medical, educational and other records without probable cause. (First, Fourth, Fifth, and Sixth Amendments). •Trial of non-citizens accused of terrorism before secret military tribunals which deprive the accused of an independent forum, their chosen attorneys, the presumption of innocence, proof beyond a reasonable doubt, confrontation of evidence, exclusion of hearsay, a unanimous verdict, and habeas corpus review by civilian courts. (Fourth, Fifth, and Sixth Amendments; Geneva Convention). •Open consideration of torturing prisoners suspected of terrorism. (UN Convention Against Torture, Fifth and Eighth Amendments). History teaches that our civil liberties and democratic rights are most endangered—and most essential—during times of crisis. ALAA, therefore, supports and endorses all efforts to defend these freedoms against attacks such as those discussed above. “Runaway shops” typically include “factories and other business enterprises that move away from unionized . . . areas . . . to non-union . . . areas,” Le Blanc, A Short History of the U.S. Working Class (1999) 174, or “[a] unionized plant transferred to another location . . . in order to evade bargaining obligations or to destroy a union.” Murray, The Lexicon of Labor (1998) 159. Here, the Giuliani administration itself established defense contractors for the classic union-busting purpose of “farming out work or a phase of production, hitherto done by union members,” id., at 45, at the unionized Legal Aid Society. ·”Battiste, Aronowsky & Suchow” in Staten Island. Q & A on CDD Comp Time (ALAA, Jan. 23, 2002). Based on this position, the DC also voted that the Union will not formulate criteria for involuntary intra-division transfers. Transfers and layoffs related to job security are governed by ALAA Contract Article III, § 13. Fritsch & Rohde, On Appeals, the Poor Find Little Leverage, N.Y. Times, April 10, 2001, at <http://www.nytimes.com/2001/04/10/nyregion/10LAWY.html?ex=987913258&ei=1&en=4cdd938a66b41ba5&gt;; Fritsch & Rohde, For New York City’s Poor, a Lawyer With 1,600 Clients, N.Y. Times, April 9, 2001 , at <http://www.nytimes.com/2001/04/09/nyregion/09LEGA.html?ex=988028792&ei=1&en=07ff6fba42d79983&gt;; Fritsch & Rohde Legal Help Often Fails New York’s Poor, April 8, 2001, at <http://www.nytimes.com/2001/04/08/nyregion/08LAWY.html?ex=988028823&ei=1&en=d4c5de3b29545b32&gt;. Painless Cost‑Cutting, NY Times, Jan. 30, 2002, at <http://www.nytimes.com/2002/01/30/opinion/_30WED3.html?ex=1013404601&ei=1&en=aaff606843e62c8b&gt;; Feuding With Legal Aid, NY Times, Dec. 11, 2001, at <http://www.nytimes.com/2001/12/11/opinion/11TUE3.html?ex=1009070793&ei=1&en=e870db848bbca118&gt;. In contrast to the New York Times, to independent oversight reports, and to common knowledge, the runaway contractors have made a concerted effort to propagate the myth that the Giuliani’s policies have improved, rather than damaged, indigent defense. On December 15, 2001, for example, the New York Times published a letter by Bronx Defenders director Robin Steinberg opposing restoration of LAS funds on the grounds that “[then-]Mayor Rudolph W. Giuliani is continuing a five‑year‑old plan that seeks only to improve the overall quality of legal services by promoting the same competition that fosters invention and progress in every other field. Alternate providers have actually enhanced the quality of justice for New York City’s poor. . . . No one is trying to eliminate the Legal Aid Society. The only thing at risk is the credibility of a system that focuses more on organizational ego than client well‑being and justice.” <http://www.nytimes.com/2001/12/15/opinion/L15LEGA.html?ex=1013605487&ei=1&en=585d0a91bebcbd77&gt;. In 1998, Lynn Fahey (“Appellate Advocates”) testified in 1998 that the city’s “institutional providers . . . are all very adequately funded,” and that “[i]t’s a pleasure to practice in New York City.” Test. of Lynn Fahey (Oct. 14, 1998), In the Matter of Fact Finding Hearings held by the New York State Defenders Association and the League of Women Voters of the State of New York <http://www.nysda.org/Hot_Topics/Fact_Finding_Hearings/NYC_Transcript.pdf&gt;. And in 1996, Lisa Schreibersdorf asserted that “Brooklyn Defender Services’ entry into the court system has even lightened the load of the Legal Aid Society’s attorneys who . . . are overworked and underpaid . . . [so that they] are now able to more effectively represent their own clients.” Affirm. of Lisa Schreibersdorf (July 16, 1996), Legal Aid Society v. NYC, No. 603291-96 (N.Y. Sup Ct.). The Unions have played an indispensable role in opposing Giuliani’s attacks on LAS. In 1998, an intense campaign first won a $5 million restoration of LAS criminal funding. Report on New Giuliani Administration Attacks on Legal Aid Society Criminal Funding (ALAA, June 24, 1999). As a result of Union lobbying last year, the City Council raised its LAS criminal add-on to $5.6 million, and fully restored LAS civil funds cut by Giuliani. Email of June 7, 2001 from ALAA HQ to ALAA members. The EB had proposed that the issue by resolved through a process which would: (1) Clearly define the new policy; (2) Schedule expedited, “last‑best‑offer” arbitration to be held within a brief time‑frame (e.g., 4‑6 weeks) to resolve the limited issue of the new policy; (3) Pending arbitration, seek a negotiated resolution of the dispute; (4) Pending a negotiated or arbitrated resolution, suspend the new policy’s implementation; (5) Incorporate the results of negotiation or arbitration into the contract effective October 1, 2002; and (6) Condition final Union agreement to this procedure on ratification by the Delegate Council. ALAA Union Update (Feb. 12, 2002). Subject to the Society and ALAA successfully negotiating the terms, time frames and scope of the process, the Society has agreed to submit the issue of compensatory time payouts to a limited form of arbitration, which will include a set period for negotiation between the Society and ALAA, and ultimately, if we are unable to reach agreement, the presentation of ‘last, best offers’ to an arbitrator. During this period, the Society will temporarily suspend the policy regarding compensatory time payouts, which was issued on January 7, 2002. Members present at the February 21 meeting were: David Affler (Del., CDD-M6), George Albro (Secretary-Treasurer), Danny Ashworth (Del., CDD-Bk2), Peter Blum (Alt. VP, CAB/Capital/FDD), Tom Bomba (Del., CDD-BxC), Jessica Botticelli (Alt. Del. CDD M-6), Mari Carlesimo (Alt. Del., Volunteer/CLO), Joanne Daley (Del., CDD-M1), Joseph Diflumeri (Del., CDD-Q4), Alexandra Flanders (Alt. Del., CDD-Bk3), Yvonne Floyd-Mayer (Del., Civil-Immigration), Gail Geltman (VP, CDD-Bx), Larry Gurwitch (Del., CDD-BxB), Charlotte Hitchcock (Recording Secretary), Carol Hochberg (VP, JRD), Michael Letwin (President), Nancy Little (Del., CAB), Nicholas Lundgren (Del., Volunteer/CLO), Eileen McCann (Del., Civil-SI), Susan Morris (Alt. Del., CDD-Bk3), Michael Taglieri (Alt. Del., CAB), Azalia Torres. (Alt. VP, CDD-Bk), Joseph Zablocki (Del., CDD M-6), Milton Zelermyer (Del., PRP), and Robert Zuss (VP, CDD-Bk). The single dissent was cast by a delegate who, despite his personal support for the statement, voted the majority view of his complex. The Delegate Council also decisively rejected motions to: (1) Table the proposed statement (Zablocki/Botticelli)(hand vote); and (2) Prohibit ALAA HQ from seeking to disseminate the Union’s statement (Zablocki)(3-18-1). ·American Bar Association (ABA) <http://www.abanet.org/media/terrorresponse.html&gt;. ·American Civil Liberties Union (ACLU) <http://www.aclu.org/congress/issues107.html&gt;. ·AFSCME Local 2627, DC 37 <http://groups.yahoo.com/group/LaborAgainstWar/message/90&gt;. ·Center for Constitutional Rights <http://www.ccr‑ny.org/whatsnew/september11_outreach.asp&gt;. ·Communication Workers of America, Local 1180 <http://www.cwa1180.org/news/WTC9.html&gt;. ·Criminal Justice Policy Foundation <http://www.cjpf.org/speeches/terrorism‑statement.html&gt;. ·Lawyers Committee for Human Rights <http://www.nyclu.org/#WTC&gt;. ·National Association of Criminal Defense Lawyers (NACDL) <http://www.nacdl.org/public.nsf/freeform/news&issues?OpenDocument&gt;. ·National Legal Aid and Defender Organization (NLADA) <http://www.nlada.org/Defender/NLADA_News/1001449258.68&gt;. ·New York Civil Liberties Union (NYCLU) <http://www.nyclu.org/#WTC&gt;. ·People for the American Way <http://www.pfaw.org/news/press/2001‑09‑20.323.html&gt;. ·Professional Staff Congress-CUNY (PSC-CUNY) <http://www.psc‑cuny.org/Sept11.htm&gt;. ·Sacramento Central Labor Council <http://groups.yahoo.com/group/LaborAgainstWar/message/404&gt;. ·San Francisco Labor Council <http://www.igc.org/laborstandard/New_Postings/SF_labor_council_re_91101.htm&gt;. ·Service Employees International Union (SEIU) <http://seiu.org/political_action/getinvolved/tragedy_unite.cfm&gt;. ·United Auto Workers (UAW) <http://www.uaw.org/cap/02/issue/issue11.html&gt;. ·United Electrical Workers (UE) <http://www.ranknfile‑ue.org/policy_cl.html&gt;. ·United Teachers Los Angeles (UTLA) <http://groups.yahoo.com/group/LaborAgainstWar/message/629&gt;. “We are a coalition of lawyers, advocates and communities concerned about police brutality. Last week’s U.S. Court of Appeals for the Second Circuit’s decision in United States v. Volpe raises serious questions about the relationship between the Police Benevolent Association, the New York Police Department and the City, and fairness of our system of justice. “Notably, a multimillion-dollar attorney was deemed “insufficient” at a time when thousands of New York citizens are served by over-worked legal aid attorneys and $25 an-hour attorneys through the under-funded 18B system. “An irony of this case is that many poor and disadvantaged people convicted of crimes raise the issue of ineffectiveness of trial counsel on appeal, and it is rarely a success. We hope that this decision is not another example of the special treatment of police defendants in criminal actions—special treatment that the Abner Louima assault case unearthed. “The blue wall of silence has protected these officers yet again. The PBA lawyers participated in the blue wall of silence, and ironically, the officers’ convictions were reversed based on that fact. “The PBA prevents criminal investigations into police officers for 48 hours after an incident—a privilege to which no other suspect is entitled. PBA agents and lawyers may be actively involved during that 48 hours in construing a story of the incident. In this instance, the PBA hired lawyers to defend the police officers, but the PBA made it clear that these lawyers’ future business relationship with the PBA depended on their ability to shield not only the police officers but also the PBA from criminal and civil liability. “The PBA’s contractual arrangement with the firm of Stephen Worth, who represented Officer Charles Schwartz, guaranteed an ethical violation and caused reversal on appeal. “This decision is a wake-up call to the community and New York City that it is the city’s responsibility to force the PBA to change its policies. “When the city renegotiates contracts with the PBA, it must (1) refuse to grant police officers special privileges, such as the 48-hour rule, in criminal investigations, and (2) insist that the PBA institute an independent process of retaining counsel for police officers charged with crimes to prevent the conflict of interest that the recent decision condemns. “We can only hope that this decision does not become yet another instance of special treatment for police offices charged with crimes, and the principles behind the decisions are now applied equally to all defendants. “This year presents the best chance in many years to see reform of the draconian Rockefeller Drug Laws that have so tragically impacted the lives of many of our clients and their families for more than a generation. The Legal Aid Society, with its first-hand knowledge of the devastation caused by these laws, is in a unique position to advocate for a change of these laws. “Drop the Rock,” a lobby day and rally scheduled for Tuesday, March 26 in Albany, is an opportunity for us to educate the Legislature about the urgent need to reform these laws. “The Society has approved release time for Legal Aid employees who will support this lobbying effort by meeting with legislators to educate them about the need for reform of the state’s drug laws. Staff who want to attend the rally but aren’t selected and trained to meet with legislators may take a personal, comp or vacation day. “1199 will be providing buses for Legal Aid staff who are going to Albany on March 26th to lobby or attend the rally. Buses will leave from 310 West 43rd Street, Manhattan. Boarding will begin at 6:30 a.m.; the buses will depart at 7 a.m. sharp. Buses for the trip home will leave Albany at approximately 4 p.m., and should return to the City at about 7 p.m.
“In order to insure that all offices have sufficient staff for case coverage and court assignments, it is important that all staff who want to participate in the March 26th event seek preliminary approval from their supervisor ASAP. Case-handlers who have an institutional assignment or cases calendared on that day must make arrangements for coverage by a colleague. “If you want to lobby, please send an e-mail to Bernette Carway-Spruiell once you have obtained preliminary approval of your release request from your supervisor. Bernette will coordinate appointments with legislators for Society staff. All staff who are scheduled to meet with legislators must participate in the Society’s Rockefeller drug-law lobby-day training, which will be provided before the lobbying day. “Final approval of requests for vacation, comp or personal days will be made by Division Heads, and will be dependent on case and court coverage, and the total number of people in the Division who are seeking to go to Albany. Approval of release requests for staff who wish to lobby will be determined by those factors, as well as the number of appointments with legislators that must be covered on that day. The Society will determine how many lobbyists are needed prior to the training that will be scheduled for lobbyists. In the event that the number of people interested in lobbying exceeds the number of available slots, staff who are not selected for lobbying may elect to take a personal, vacation or comp day to participate in the rally, subject to the previously mentioned staffing concerns.